As we bid farewell to Dr Dave Smith, hours have been cut at the GP practice, as the Cooloola Coast Clinic searches for more doctors. Last month, we were advised the centre would operate three mornings a week, with a variety of doctors from the Tin Can Bay Clinic. Decisions on the practice have serious ramifications for our town. Once a service is dropped, (or reduced with different practitioners) there is a risk that community members will look to Gympie or Maryborough for medical appointments, or worse still, they will not seek assistance at all. This could be life threatening for some residents. I asked that they consider operating some afternoons to improve access for students and offer non-consecutive days. I also asked that, after recruitment is successful, they consider assigning a doctor to Rainbow Beach, or that the position be advertised as part time? 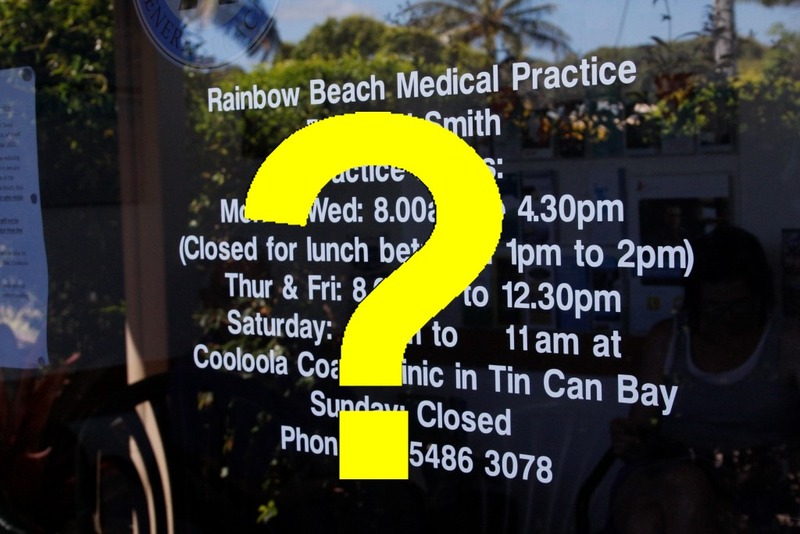 As I waited in the Rainbow Beach surgery the other day, there were several calls requesting appointments within minutes. It was 8.10am and already he was booked out for the day. I am sure that Rainbow Beach as a community could look at other incentives to help entice a doctor here permanently. Rainbow Beach offers an enviable lifestyle for doctors seeking work-life balance. Michelle Gilmore spoke to owner of the practice, Dr Peter Martin to find out more. The doctors from Tin Can Bay will be providing temporary cover at Rainbow Beach till we can contract and complete the orientation of at least one new doctor. We will endeavour to provide at least one afternoon session plus 2 morning sessions per week during this time. All appointments will be reserved for Rainbow Beach residents and tourists. Once we have a new doctor who is suitable to visit Rainbow Beach, that doctor will start doing several of the sessions. Every Rainbow Beach resident who requests an appointment will get an appointment that session or the next working day. Appointments can also be made up to 2 weeks in advance as at present. Once our new doctor(s) have settled in, we will commence a full chronic disease management program at Rainbow Beach, which will be run by one of our nurses. We have always endeavoured to provide high quality services to Rainbow Beach and will continue to do so. Dr Martin explained that more than half of Dave’s patients were from Cooloola Coast and Tin Can Bay. He had eight full sessions, so they have calculated that 4 sessions a week at the most should be adequate. “We can’t have doctors sitting over there doing nothing.” Dr Martin said. Losing a GP will increase the workload significantly for the current GPs at Tin Can Bay. The practice manager has been aggressively recruiting, not one doctor, but two since early November. Why is recruitment such a problem? Dr Martin assures the Community News that he offers comparable salary packages, with the latest resources in a modern clinic. There is also a government grant doctors receive for working in a rural area. He explained attracting doctors is always really difficult because of our rural/remote location. Doctor’s partners are often professional people – and it may be impossible for the spouse to find work – even Gympie wouldn’t be big enough for job opportunities for some. On a positive note, they have secured four specialists (Cardiologist, Urologist, Orthopaedic and a Gastroenterologist) to visit Tin Can Bay, which will mean significant reduced travel and waiting times for the community. What is the after-hours procedure? Dr Martin says to make an appointment come over to Tin Can Bay, and the doctor can access that same information in your common data file. He says it is just a “little bit of travel – 20 minutes”, if someone is “acutely ill”. If it is evenings or weekends, call emergency after hours on 000, to visit accident and emergency at Gympie hospital, or for non emergencies call 13 HEALTH.